The Huawei P8 will be unveiled on April 15th at an event in London. Recently, an alleged image of the device was leaked by @OnLeaks which revealed a metal frame and chamfered edges. On Monday, the P8 was certified in China by TENAA, which is the country's version of the U.S. FCC. According to the agency, there will be six different versions of the Huawei P8 with three of them being carrier variants of the phone. TENAA lists the HUAWEI ALE-TL00, HUAWEI GRA-UL00, HUAWEI GRA-UL10, HUAWEI GRA-CL10, HUAWEI GRA-TL00 and the HUAWEI GRA-CL00. The trio of carrier models supports dual 4G networks. All six have things in common like a microSD slot, dual SIM dual standby (which means only one SIM card is active at a time), and Android 5.0 pre-installed. The Huawei P8 could feature a build made from both metal and plastic with glass protecting some areas like the front of the phone.The handset is thin, although possibly not as thin as the 6mm originally rumored. 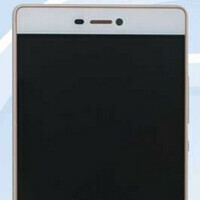 The phone will carry a 5.2-inch screen with 1080 x 1920 resolution, and Gorilla Glass protection. A home-grown 64-bit octa-core Kirin 935 SoC will be under the hood with 3GB of RAM and 32GB of native storage on board. A 13MP shooter is on back and Android 5.0 will be pre-installed. As you can see from the pictures in the slideshow, the left-side of the phone is clean with various controls found on the right side. The Huawei P8 will be priced at the equivalent of $480, which just so happens to be the rumored price for the HTC One E9+. HTC is expected to be unveil the One E9+ the week before the P8 is unwrapped. That means both models could be competing against each other in China's high-end smartphone market. I'd get this over the One E9+. This thing is gorgeous! Why all phone picture taken by TENAA looks blueish and kind of dull.